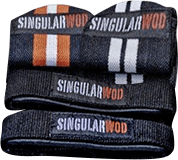 The Singular WOD sled allows you to work out your entire body in a functional way and improves strength and endurance, exercising both your upper body and your legs. Manufactured with black lacquered iron and boasting a highly resistant finish and a perfect grip, the Singular WOD sled allows you to do verydynamic and intense pull and push exercises, either indoors or outdoors, on almost any surface, track or field. In addition, the product includes a 6-meter-long nylon strap, a 25-meter-long cord, and two push bars which allow you to vary the type of exercises throughout your workout routines. Anchoring system for sled: Clamp.